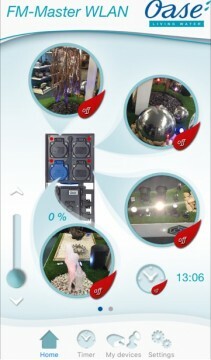 Blog | Water Garden Ltd - Smart Phone Controlled OASE ProfiLux RGB Lights. Smart Phone Controlled OASE ProfiLux RGB Lights. The OASE ProfiLux LED RGB is an advanced, DMX controllable, multi-coloured, submersible lighting system incorporating sophisticated German fountain technology simplified for mainstream use. Using technology from the commercial OASE Fountain Technology systems, DMX-RDM controllable lighting typically used in public and commercial applications is now available to private users too in a scaled down easy to use format. Fixed Colour Selection Standard (Red, Green, Blue). 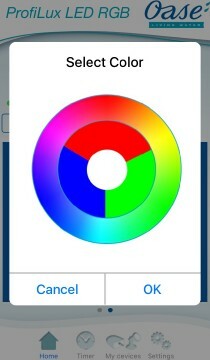 Fixed Colour Selection Wheel (Whole Spectrum). 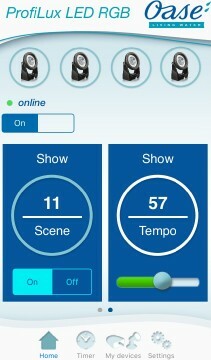 Show Tempo (0-100% Speed control of all show scenes). Show Scene (11 Selectable colour-change programs). ProfiLux LED RGB lights are connected to a submersible driver with up to 4 LED lights units connected per driver. A DMX-RDM cable plugs into the driver and the OASE FM Master WLAN control unit to transfer information to the driver and effect the light settings. A smart phone or tablet with loaded app provides the method of control. The bright 7.5 watt RGB LED lights are pre-wired with 5 metres of power cable for connection to the transformer via special watertight gasket seals which make the entire lighting system suitable for outdoor and underwater use. The transformer is connected to the land-based FM Master receiver via a DMX cable with the same waterproof connections. ProfiLux RGB Extension Cables can be used to increase the distance between the spotlights and the transformer to a maximum reach of 12.5 metres. The DMX Cable can also be extended to a limitless range using additional EGC Connection Cables and EGC Cable Connectors. 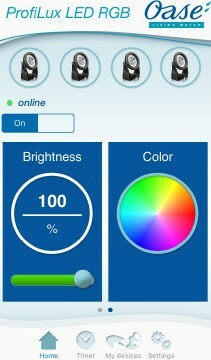 Multiple ProfiLux RGB LED light systems can be controlled via the same FM Master WLAN device and app. This is achieved by linking transformers with DMX-RDM cables. Each connected transformer is controlled independently by sliding screens on the app. All ProfiLux LED lights connected to the same transformer will synchronise and lights on separate transformers are controlled independently. The FM Master WLAN control unit can also be used to connect and control other devices via on/off and variable speed channels, allowing smart phone switching of water features and fountains as well as full colour control of the lighting system. The FM Master WLAN is able to produce its own Wi-Fi signal which can be found from a range of up to 80 metres away. This device can also be opened up to cloud control which enables device switching and control with unlimited range. OASE ProfiLux RGB LED are available to buy at component level but we have also produced packaged sets consisting of a single transformer, DMX connection cable, FM Master WLAN EGC control unit and 2, 3 or 4 ProfiLux RGB LED spotlights. These ProfiLux RGB LED Spotlight Sets are off-the-shelf solutions containing all of the necessary components ready to install.